"...great revolutions have a “fractal” quality, where “social order breaks down on multiple scales simultaneously,” from the family to the town to the city to the national government and across many social institutions. I’ve always found this idea quite useful for thinking about what distinguishes a simple revolt (where a normative breakdown is restricted to say, the national government institutions) from a big revolutionary upheaval. It certainly applied to the Russian revolution, where everything – family norms, clothing, architecture and arts, cities and town planning, public monuments, religion – seemed to be up for negotiation simultaneously." In contrast our own Easter Rising, the centenary of which we commemorated last year, was more of a rebellion than a revolution: the rulers changed - the rules not so much. Which brings us to the Protestant Reformation 500 years ago today when Luther nailed his 95 theses to the church door in Wittenberg (apparently he didn't, but it's a memorable image, though nowadays his theses would be the perfect length for twitter...). The Reformation was neither a rebellion nor a revolution, but arguably its consequences over the long run evolved from those of rebellion to those of a revolution. 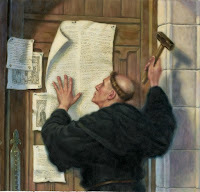 The Reformation's contemporary champions argue that the world we live in today is very much a consequence of the Reformation's reforms; while its critics likewise argue that the world we live in today is very much the unintended consequence of the same Reformation! One measure of the Reformation's consequences (intended or otherwise) is the parlous state of Catholicism in Europe today. The 2016 results from the European Social Survey (ESS 8) have been published today and they paint a fascinating picture of religiosity in Europe some 500 years after there Reformation (n.b. : for the sake of transparency, my own company conducts the fieldwork for ESS in Ireland). Based on preliminary findings for 16 countries (mainly Europe, but also including Israel and Russia, with findings for 6 more countries to be published next year), we find that just one in four European adults describes themselves as belonging to the Catholic Church. In Germany, where it all started, the percentage of adults belonging to the Catholic Church is a little higher at 30%. However, Protestantism hasn't done so well in the intervening period either. Again among the 16 countries in the first results for 2016, only 14% of adults identify as belonging to a Protestant denomination. Though a somewhat healthier 28% of Germans belong to a Protestant denomination. But the big trend is not in the share of the different Christian and non-Christian religions, rather it is the growth in the share of those who don't belong to any religion or denomination: 43% of all adults in the 2016 results compared to 38% in 2006 (albeit for a larger number of countries). 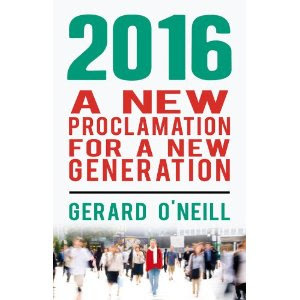 Here in Ireland, 500 years on, we still remain predominantly Catholic (73% of all adults in 2016, not much changed from 75% in ESS 2006) - though the percentage not belonging to any religion or denomination has also grown (from 20% in 2006 to 26% ten years later). Ireland's rebellion is in the past, while we continue to be buffeted by various revolutions elsewhere (political, sexual, cultural and technological). Most Catholics nowadays recognise the legitimacy of many of the complaints levelled by Luther 500 years ago (he was, after all, a Catholic priest belonging to the Augustinian order, so he knew a thing or two about the issues that drew his ire). Indeed, a growing number think we need another Reformation if Christianity is to have a future in Europe (and beyond). My guess, for what it's worth, is that the next 50 years will see a 'fourth R' - Reaction - make itself felt due to the unprecedented ageing of Europe's population and the unsustainable economic, environmental and cultural consequences that will follow. Ripe conditions for rebellion and revolution as well of course, and maybe even further reformation.